Why trade bonds with Phillip? Access to more than 70 counterparties worldwide. Access to 9 different currencies globally. Participation in both primary and secondary bond markets globally. Phillip Global Offices in 16 countries and region support price discoveries. Interested to buy a bond or want to find out more? 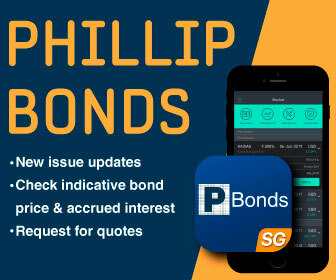 Talk to our bonds specialist at +65 6212 1818 or drop us an email at bonds@phillip.com.sg. A bond is a debt investment, where the investors lend money to an entity, typically corporate or government. In return, the bond issuer will pay the bondholder interest known as coupon (A variable or fixed interest rate which the Issuer pays for borrowing the funds for a defined period of time). On maturity date, the date of which repayment was agreed on; the investor will get back the borrowed amount, also known as face value, par value or principal amount. Principal amount: The amount that the investors lend to the bond issuer. Coupon Rate: The coupon is the amount the bondholder will receive as interest payments. Most bonds pay out interest every six months, but it’s also possible for the interest pay out to be set as monthly, quarterly or annually. The coupon is expressed as a percentage of the principal/face value. If a bond pays a coupon of 5% and its principal/face value is $1,000, the interest pay-out will be $50 per year. Maturity Date: The maturity date is the date on which the investors will get back the Principal Amount. Angel bonds are investment-grade bonds, bonds which have credit rating of Baa3 to Aaa (Moodys), BBB- to AAA (S&P) or BBB- to Aaa (Fitch) and normally offer a lower interest rate because of the high credit rating. If the company’s ability to pay back the bond’s principal is reduced, the bond rating may fall below investment-grade minimums and become a ‘fallen angel’. Callable bonds can be redeemed by the issuer prior to maturity. The main reason of a call is a decline in interest rates. If interest rates have declined since a company first issued, they would likely want to refinance this debt at a lower rate. In this case, the company will call its current bonds and reissue new, lower-interest bonds. Corporate bonds are issued by corporations. Generally, a short-term corporate bond has a maturity of less than five years, intermediate is five to 12 years and long term is more than 12 years. A high-yield bond, also known as a “junk bond” is a bond rated below Ba1 (Moodys), BB+ (S&P) or BB+ (Fitch) because of its high default risk. As the name suggests, high-yield bonds typically offer interest rates higher than investment grade bonds. Bonds that have no maturity date. Normally, they will have a call date. Bonds that are listed and investors are able to buy/sell on the exchange. They are normally traded in a smaller size as compare to the Over-The-Counter (OTC) bonds. However, prices quoted on the exchange are ‘dirty’ prices (including accrued interest) whereas for OTC bonds, prices are normally quoted as ‘clean’ prices. If you have a Phillip Trading Account, you may login to POEMS 2.0 Trading Platform to buy exchange traded bonds. Seniority refers to the order of repayment in the event of a sale or bankruptcy of the issuer. Senior bond will have their first claims on the remaining asset as compared to junior (subordination) bonds. “pari passu” is normally used to describe the equal debt ranking of the new senior bonds issuance versus other senior bonds of a company. Debt covenants are promises made by the issuer not to engage in certain actions which normally cover a wide range of parameters. Some common debt covenants are debt ratios, ownership of the company and liquidity. Keepwell agreements is usually an agreement between the parent company and the subsidiary (which is the issuer), where the parent company agrees to keep the issuing subsidiary in good financial healthy, by maintaining certain financial ratios. A generic covenant stating that the bondholder has the right to “put” the bond back to the company if there is a “change of control” event. Investor should also find out the terms and conditions of the specific bond on what constitute a change in control. Credit risk is the risk of payment default of the coupon, and even the principal amount if the issuer has problems meeting its contractual obligations. This is also known as default risk or issuer risk. Foreign exchange risk is the risk investors are exposed to when they trade in bonds that are denominated in a currency other than the functional currency of the investor caused by fluctuations in foreign exchange rates. This may erode the returns on the bond investment. Liquidity risk is the risk of having a lack of buyers or sellers in the market, which may lead to the investor not being able to execute the trade or may be forced to trade at a value significantly away from the investor’s desired price. This can be deemed as liquidity risk. The value of the bond is subjected to interest rate changes, as well as demand and supply forces. Bonds, in particular, are sensitive to interest rate fluctuations and the prices of bonds move in opposite direction with interest rates. However, this risk is more pertinent if the investor decides not to hold the bond to maturity. Bonds may be packaged with guarantee security. The failure or inability of an issuer to pay coupons and/or bond principal. Discount Purchasing the bond at a price less than the face value. Bond transferring out of PSPL custody is subjected to an exit fee of 0.5% of its nominal value. For further enquiries about Bonds, please contact your Trading Representatives or email our Fixed Income Desk at bonds@phillip.com.sg. This information is intended for general information only and does not constitute a recommendation, an offer or solicitation to buy or sell the investment products mentioned herein. It does not have any regard to your specific investment objectives, financial situation or any of your particular needs. Investments are subject to investment risks including the possible loss of the principal amount invested. Past performance figures as well as any projection or forecast used in this publication, are not necessarily indicative of future or likely performance of any securities. You may wish to obtain advice from a financial adviser before making a commitment to purchase any investment products mentioned herein. In the event that you choose not to obtain advice from a financial adviser, you should consider whether the investment product is suitable for you. You are also advised to read the trading account Terms & Conditions and Risk Disclosure Statement (available online at www.poems.com.sg) before investing in this product. 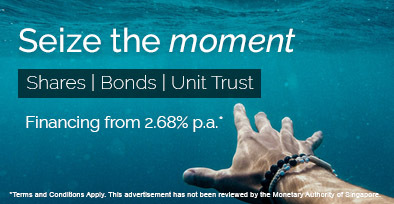 This advertisement has not been reviewed or endorsed by the Monetary Authority of Singapore.